Still not very known but studies are catching up. No long term results available though. Some people (only 2 in this forum that I know) are deriving advantages from a keto diet. My personal experience is that a real keto diet, with few protein, is not satiating, decreases appetite, leads to a hypocaloric regimen hence causes fat and lean mass loss. 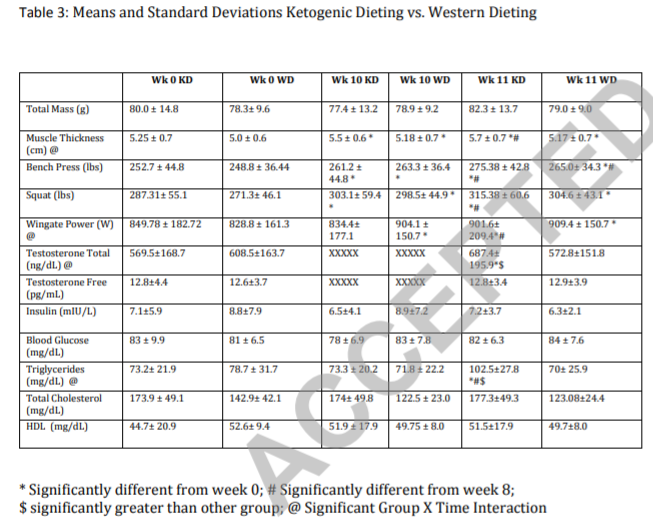 A very recent and interesting paper has shown that, in isocaloric conditions, a keto diet may preserve and even increase muscle mass in the short term (10 weeks). Valter Longo: I don't want, even though I could get more benefits from a lower more ketogenic diet, a lower carbohydrate diet, I don't want to do that. Why don't I want to do that? Because I don't want people to go back and forth in this yo-yo manner to very low carb, very high carb, because I'm worried that's going to stimulate too many variations in the program and some of them are going to have detrimental effects. So we're not used to this back and forth and so I don't want to introduce this. I'd rather have a very potent effecct but not as potent as I could. Because we always get asked why don't you reduce the carbohydrate in the FMD and that's on purpose because we don't want to push you to the edges. Mark Hyman: But it's not starch, right, it's vegetables. Valter Longo: It's not starch, it's all vegetables. Perhaps this is your reason for thinking eating keto causes wasting? I've looked but never seen anything anywhere that gives me that impression. I have seen cases where protein restriction is extreme and this can occur such as when taking it too far for too long as in the case of pursuing very high ketone levels to manage medical conditions such as epilepsy, cancer and some metabolic/neurological diseases. As for bodybuilding I see evidence of ketosis being employed with advantageous purpose, not just for cutting but for building muscle while staying lean, since the earliest days. 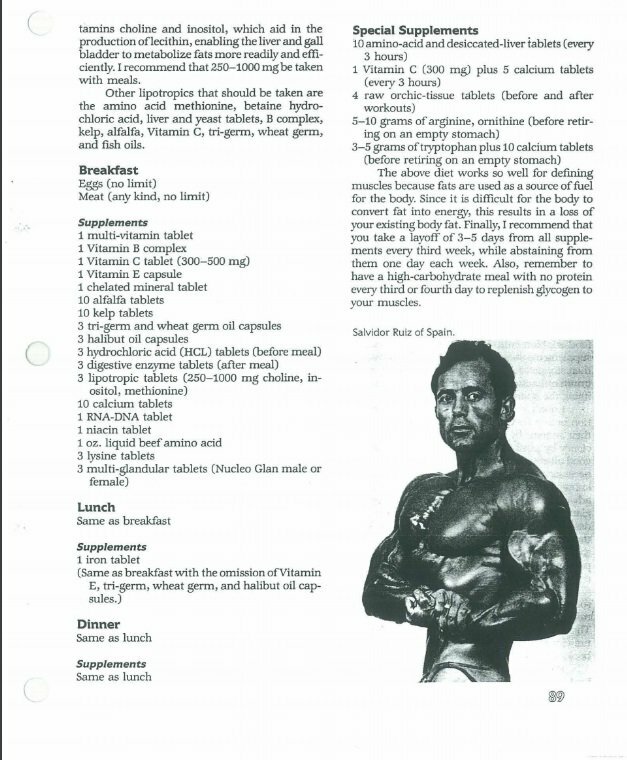 In the book Unleashing the Wild Physique by Vince Gironda he states: "Personally, I prefer to use fats over carbohydrates as energy sources"
He lists several sample diets for different purposes, maintenance, weight gain, high definition (before competitions), ovo-lacto vegetarian reset, etc. They are all low carb, mostly keto though some include fruit as the last item without specifying the fruit or quantities. The vegetables he recommends are the same as recommended today for keto, nothing starchy like potatoes or even onions. His weight gaining diet includes 2 slices of toast at breakfast and allows for a cup of milk although he says he drank cream. He claims to have coached many other body builders who followed his dietary advice with good results. Here's an article on Larry Scott who Gironda says he coached and the diet sounds much like one of Gironda's and is so low carb he was undoubtedly keto despite the high protein. Todd: I look forward to watching the hyman-Longo interview, one I didn't know. By the way, you may already know that Peter Attia uses Longo's FMD in a lowcarb version for his patients. Thanks for the vintage material from Gironda. 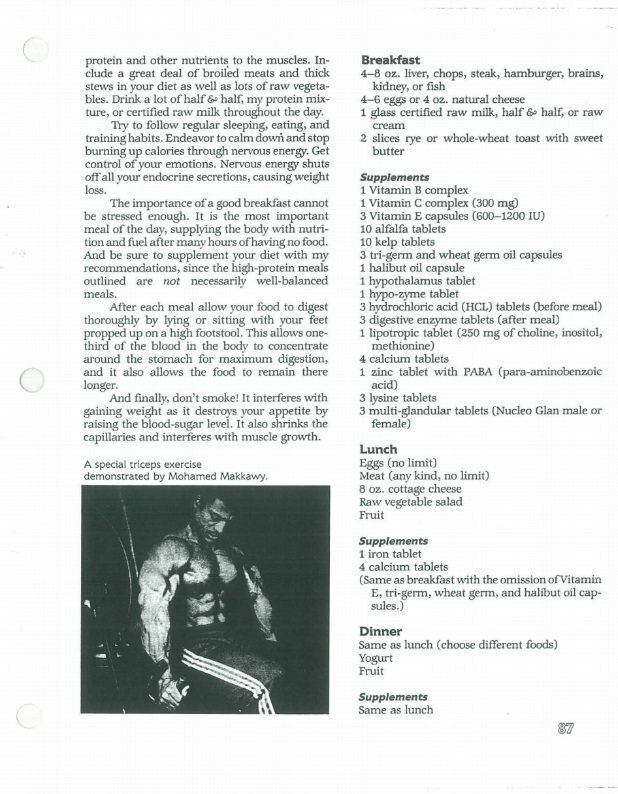 When I was young, I remember anecdotes abounded about some bodybuilders eating similar diets (as I understood, before contests), like Serge Nubret, allegedly eating 5 kilos of meat and one handful of chestnuts a day. By the way, a couple of days ago I was watching Jerry Brainum in hsi video on keto diet, explaining as some bodybuilders used it (he cites by the way vince Gironda who suggested that to him). Pretty interesting vid, he's not against keto diets but not a die-hard supporter either. Todd Allen: When I hear Valter and others speak about keto I tend to see them critical of things that fall into the realm of keto just as others can be critical of things vegan, such as Twinkies, but yet I see the acknowledgement keto encompasses wide ranges of possibilities with redeeming aspects.. Yes, Longo talks about redeeming aspects of keto diets--- but only for short term purposes (or some extreme medical cases). Perhaps a keto FMD, for general rejuvenation-- 5 days three or four times a year. Or short term keto diets for weight reduction or Alzheimer's treatment. But the ideal is always to get back to a non-keto longevity diet. Here's an article on Larry Scott who Gironda says he coached and the diet sounds much like one of Gironda's and is so low carb ﻿he was undoubtedly keto despite the high protein. My opinion on that is because of my own experience and the anecdotal reports of many bodybuilders and some doctors treating patients with weight training and moderately low carb diets. Listening the Jerry Brainum vid, I understand that there is a very high individual variability, people who don't loose weight easily are maybe at an advantage with keto diets, whereas those who tend to loose weight very easily see this tendency exacerbated with few carbs. Anyway, the Wilson et al. 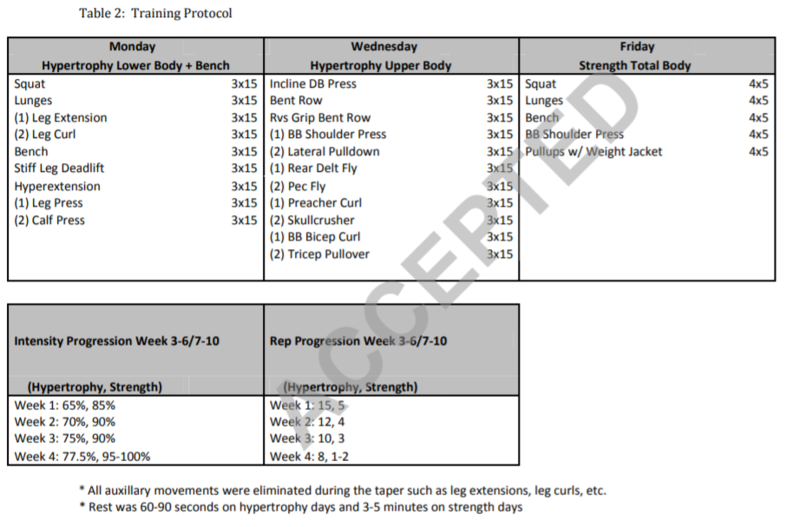 study, which you brought to my attention and that I posted above, at last sheds many doubts on resistance training and keto regimen. It is a good clinical study, made on humans, not too many but not too few, it lists all relevant details, their workouts, bodyweight, macros, relevant blood works and so on. It takes time to analyze it since it carries so many details. 2600 kCal and 133 g of protein (not very much protein really as far as bodybuilders go). Sure it has been proven that, with enough calories and enough protein, a keto diet during 7-10 weeks (7 of training) does not cause muscle wasting, on the contrary it may cause a few gains, while shedding fat tissue at the same time. The real breakthrough of this study though, and something bodybuilders will be avidly reading and probably practicing in the future, seems to be the really significant gains in strength and lean mass following one week of carbs reintroduction after 10 weeks of carbs deprivation. 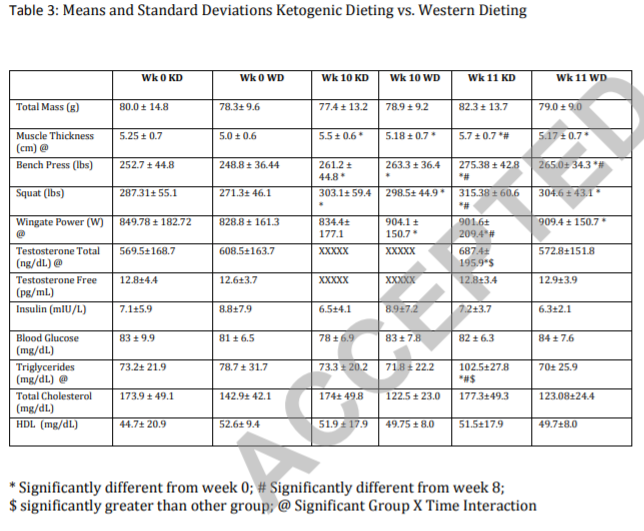 It almost seems like the authors (among which old foxes like phinney and D'agostino) wanted to provide some very convincing results for a keto regimen, even if short term and with reintroduction of cabs afterward. 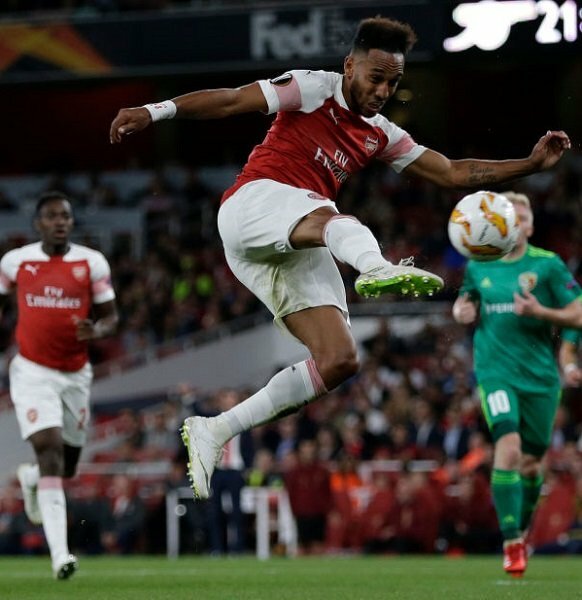 They succeded in that. Now it's hard to carry out a long term clinical study and probably few people have been lifting weights on a keto diet for years. Adherence may be a problem, since, at least in my personal case, eating those many fats after a while turns out to be impossible and takes inevitably to a plunge in the caloric level. Peter Attia during his keto stint used to eat, as he recounts, whole tubs of sour cream. And apparently got sick of it. Gironda went a little over, 79, although the cause of his death seems unkown. Pretty premature death by our standards. Gironda was probably a natural, I don't know about Larry Scott. 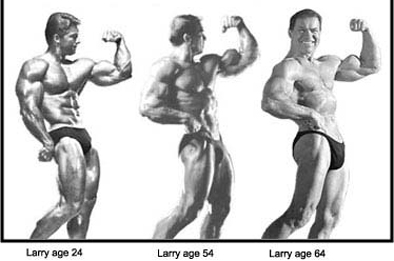 I didn't bring up Larry Scott as an example of an ideal longevity approach but rather to counter the notion that ketogenic diets inherently produce muscle wasting. And if one considers the numerous early deaths of high carbohydrate bodybuilders it doesn't suggest carbohydrates = longevity. Todd Allen:... it doesn't suggest carbohydrates = longevity. Nobody is suggesting that. Certainly not Valter Longo! In fact, near the end of the video (1:21:37) he says the single most misguided kind of common nutritional thinking he'd like to debunk is that simplistic single-element kind of thinking you just expressed. Of course the bodybuilding diets described-- tons of food, including tons of protein, unlimited meat, eggs, poultry, dairy --would hardly be expected to produce muscle wasting. Has anyone argued that such a bodybuilding diet would? Who? In any case, my main point was that whenever Longo favorably discusses keto diets in that video, he stresses that they should be a limited, short term intervention for serious problem cases. See, for example, the video starting around 59:50 where he discusses the problems coming from eating too many starchy/sugary carbs, and the possible beneficial use of a keto diet short term, "maybe one or two shots", to "reset" and get back on a healthy track, i.e., to "use the ketogenic diet to get to the longevity diet" (1:01:45). Mccoy: Gironda went a little over, 79 ... Pretty premature death by our standards. 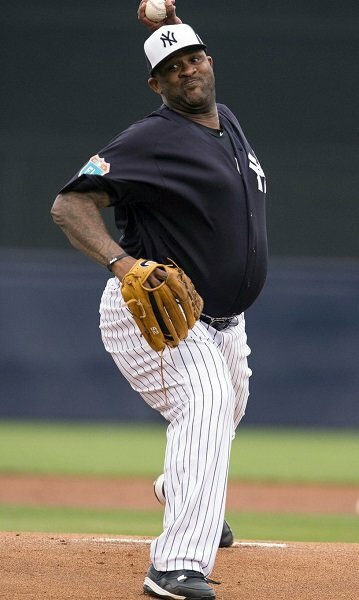 Longo in that video says his aim is to help people get to 110 healthy. "Basically I eat a lot of meat, cheese, and eggs. I like cottage cheese and meat--mostly beef in various forms. I eat almost no carbohydrates and very few vegetables. I supplement my diet with Johnson's Protein. That is about it. It's a rather bland diet but it seems to work best for me at the present time anyhow." "I was using from 11/2 to 2 cups of Johnson's Protein (Rheo H. Blair's Protein) per day. I would mix it with cream and milk. I used about 2/3 of a quart of cream a day in mixing this along with the milk to make it the desired consistency. I took this protein-cream mix three times per day. I would eat 6 to 8 times per day. I would have breakfast, then a snack at 10 A. M. and then lunch at noon, then another snack at 2:30 P.M., then dinner plus the Protein-Cream drink. My evening meal is eaten after I work out." However, the diet in the Wilson et al. article is much more moderate (2600 kCal, 133 g of protein), and in the period stated it did not cause muscle wasting. It did cause fat wasting and on the long run, if fat went below the minimum vital threshold, then the body would have had a choice, to die or to use muscle mass for energy. So maybe an higher caloric level would have been required on the long term compared to a high-carb diet to preserve muscle mass. I'm maybe starting to understand like people like d'Agostino are able to preserve muscle on a long term KD, probably eating enough calories by eating enough fats. I repeat though, not everyone is able to eat so many fats and, if the lipids go over the roof, even less people would be able to thrive on so many monounsaturated and poliunsaturated fats (drinking EVOO would be the only practical way to reach the energy threshold required). Buy the way, Peter Attia in his very long podcast with tom Daysprings on lipids, at a certain points defines the LDL-P and TG levels which are suggested for longevity, and they are values below the 50% percentile. In few words, lipids seem to count in the conceptual engineering-like model built by Dr Attia. If KD causes and elevation of LDL-P (which is correlated to LDL-C) and TGs, then it increases CV hazard and is unfavourable to longevity. The Longo-Hyman vid is very good indeed, Longo is not unfavourable a priori to the KD but probably is concerned with the known possible drawbacks like high lipids and inflammation. His cited suggestion to use it as a shortcut to then land onto his low-glycemic longevity diet sure sounds reasonable. As Todd hinted at in the other thread though, in pre-diabetic individuals some of the cereal meals advised by Longo might cause high glycemic peaks. In such people the longevity diet should be either adjusted by choosing the right cereals (measuring glycemia post-meals) or may be trying to follow a keto diet before if it improves glucose intolerance. 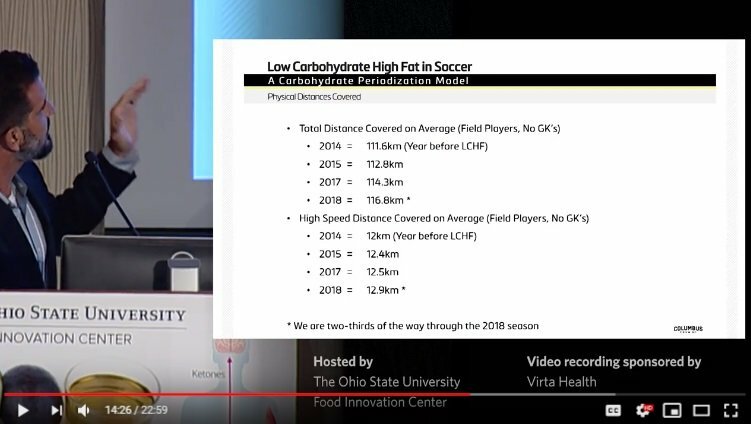 A presentation on the US Major League Soccer team Columbus Crew SC and their increasingly positive experience over the past 4 seasons since adopting a LCHF team diet. While not RCT quality evidence it does suggest like other anecdotal evidence that it takes time to adapt to this dietary approach and if there was funding for longer RCTs they might show more impressive results. If KD causes and elevation of LDL-P (which is correlated to LDL-C) and TGs, then it increases CV hazard and is unfavourable to longevity. Typically ketogenic diets dramatically lower triglycerides, moderately increase LDL-C and are neutral on LDL-P though there are cases both sharply up and down. They also raise HDL somewhat correlated to the amount of saturated fat. 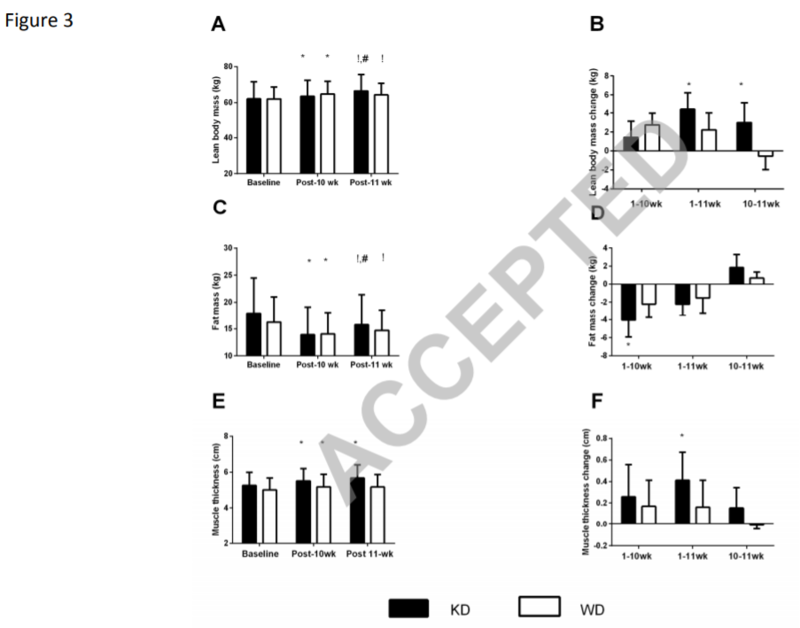 This was the pattern in the lipid data of the Wilson study of resistance trained men though due to the short duration the figures hadn't adjusted as much as people see after a year or two. Here's a presentation by Dr. Ronald Krauss where he goes into some detail on these factors and the decrease in risk of CVD. Todd, I saw all the Ron Kraus vid, it seems that the conclusions (eat more fat and less carb to express less of the phenotype B) are applicable to only a subset of the population (those whith more adiposity). So, we might repeat what Valter Longo says, for those with particular problems, adopt a keto diet to express less of the phenotype B, loose weight, and then readjust to a more balanced diet. Very good podcast, as a host Dr. Scher of diet doctor, a low carb, keto proposing business. Dr Attia answer to the questions on keto and longevity and practical use of keto diet. Concise answers: no one knows to date if KD can improve longevity. No data. Whereas KD is definitely a useful tool for some people to treat some disorders as obesity and high glycemia, although we don't know if and when the body has really reset if not out of ketosis. He stopped practicing KD because wished to eat more vegetables, which beyond a certain quantity put him out of keto. Pretty similar to Valter Longo's statements: KD useful for some people to reset the system but not long term. Peter Attia does not rule out the long term, but underlines the practical diffculties of the diet. 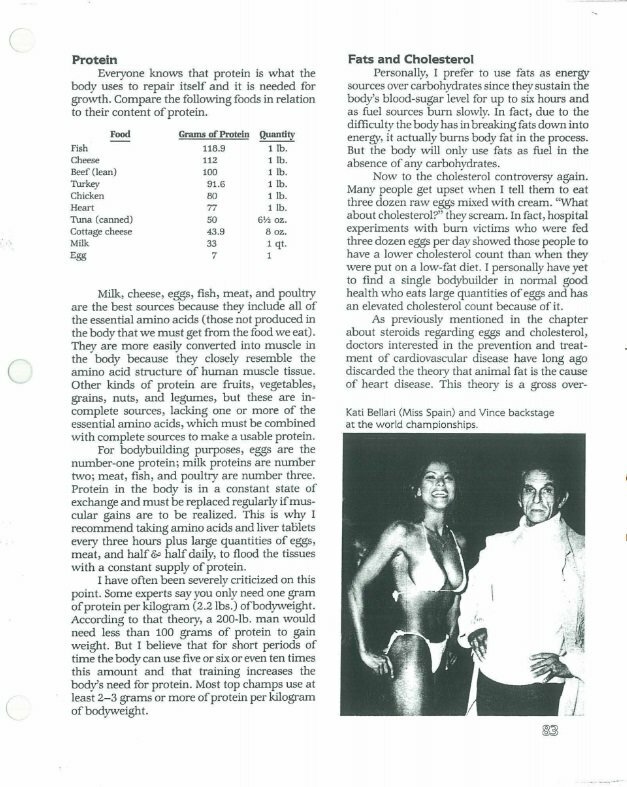 By the way, a couple of days ago I was watching Jerry Brainum in hsi video on keto diet, explaining as some bodybuilders used it (he cites by the way vince Gironda who suggested that to him). Pretty interesting vid, he's not against keto diets but not a die-hard supporter either. Mccoy, thanks for the interesting video from Jerry Brainum. It was good to hear him discuss how widespread the use of low carb dieting was in the early days of body building. Vince Gironda made claims that he had influenced many to try it and it was widely adopted because many struggled to achieve in any other way the ridiculously low body fat percentages that had become essential to be competitive in the sport. I was hesistant to bring up Gironda's claims that extreme carb restriction was common because I thought it might be self promotion. I've found some examples such as Larry Scott but I've also found high carbers from that era. And few consistently stick to a single diet for long periods. What happened is after a month of going on a straight ketogenic diet, no carbohydrates 7 days a week we started to experience severe muscle loss. And the reason was because when we instituted this drop of the carbohydrate on weekends we were already like low on body fat and the contest was only like a month away so we wanted to get like really ripped, so we thought if we cut out all carbohydrates we would get like even more ripped. But what we didn't realize was the lack of body fat coupled with the lack of total carbohydrate intake wasn't enough, the protein we were taking, we were taking a lot of protein, it wasn't enough to prevent the muscle loss. So both of us experienced a severe muscle loss and I learned a lesson. The lesson to be learned from my experience is that is not a good idea to stay on zero carbohydrates all the time. You can use it to kick start a body fat loss diet, you can use it for about 6 to 8 weeks. A very important thing to remember about these kind of diets is it takes about 3 to 4 weeks to become what they call keto adapted. In other words it takes about 3 to 4 weeks for your metabolism to change over from a sugar burning machine into a fat burning machine. And in those 3 to 4 weeks because of these metabolic changes most people will feel like absolute crap. You're going to feel fatigued, your going to feel a little bit foggy in the brain and that kind of stuff. Back then when I trained when we used those diets years ago we didn't understnad the reason for this but today they know what causes these initial side effects is a loss of electrolytes and minerals. Because a ketogenic or low carbohydrate diet induces a very potent diuretic effect. Because each gram of glycogen is stored with 2.7 grams of water. And when you deplete carbohydrates you basically breakdown the glycogen and within about 2 days of not having carbohydrates the glycogen is gone and the water it is stored with. And the water pulls minerals out of the body including calcium, sodium, magnesium and potassium. And you have to replace these minerals. Jerry has it significantly confused. The chain of causality is severe carbohydrate restriction (or fasting) causes a drop in basal insulin which leads to a greater excretion of electrolytes, especially sodium. In addition salt intake tends to drop when people cut carbohydrates because they are cutting breads, crackers and a whole range of processed foods that are high in salt. As sodium depletes we excrete more water to maintain blood electrolyte concentration. As the body dehydrates it becomes harder to rebuild and maintain glycogen stores. Loss of sodium leads to increased potassium excretion to maintain balance and the loss of potassium eventually impacts maintaining nitrogen balance in muscle but that is a slower later process than glycogen depletion. The rapid severe muscle wasting Jerry encountered was a loss of muscle glycogen. People today who take care to get enough sodium eating low carb or even zero carb, 5 grams daily is typical, and adequate intake of the other electrolytes don't experience the acute glycogen loss, fatigue, feeling like crap or muscle wasting. Mike, as a whole I agree with you but what about prediabetic guys? Many otherwise very healthy cereals even when cooked as whole grains may spike glycemia in some subjects. That's very individual but it happens, and I almost could not believe that but witnessed the results personally. That's why in diabetics and prediabetics a keto diet might be a useful tool to reset glucose homeostasis. I know about Brenda Davis and her low fat vegan experiments with the Marshalese, but the situation there was disastrous to begin with. The evidence is overwhelming, vegetables, legumes, some fruits like berries, nuts are damn good! Mccoy: Many otherwise very healthy cereals even when cooked as whole grains may spike glycemia in some subjects.